Mary’s professional dance career has spanned 5 decades. Originally an Olympic gymnast in the 1960’s, her first dance work was with Ballet Rambert. (1969-1974). In the mid 70’s after a year in New York in the thrall of the post modern dance and theatre scene, Mary joined forces with Jacky Lansley, Emilyn Claid, Fergus Early and Maedee Dupres and co-founded X6 Dance Space and its successor Chisenhale Dance Space, in London. These organisations provided an important context for the research and development of new dance forms and new ways of presenting work. Mary’s interest in improvisation and modes of improvisational performance began at this time and she brought these new approaches and aesthetics of dance and performance to a growing independent dance scene. 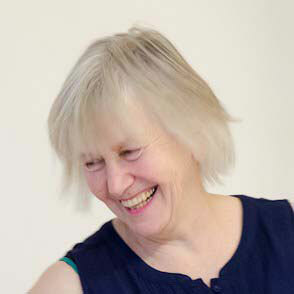 Based in Liverpool since 1995 Mary was key in the development of a dance programme at the Liverpool Institute for Performing Arts (LIPA), until 2008. With the Liverpool Improvisation Collective (LIC) artists and others, she continues to develop strategies and contexts for performance and artist exchange within the region, nationally and internationally. Mary danced for FRONTLINEdance’s hospital dance project ‘Forget Me Knot’ in 2015 and 2016 – inspired by the hospitals dementia care programme.